After a brief illness, Mary Ella Herr, 90, of Lancaster, went home to be with our Lord, October 27, 2011 at Hospice of Lancaster County inMount Joy. Born onJuly 29, 1921 inWest Lampeter Township, she was the daughter of the late Jacob H. Herr and Ella M. (Rohrer) Herr. She was a 1939 graduate of West Lampeter High School. After her retirement from PPL following 27 years of employment, she worked at Mennonite Information Center for 20 years, giving tours and lectures which she thoroughly enjoyed. She loved music and played in the Simmons Orchestra and later with a group called Melody Strings playing in retirement communities and nursing homes. She was a member of the Willow Street Mennonite Church where she was the church librarian for many years and taught Sunday School for 42 years. She was also involved in Bible Club at South Christian Street Mennonite Church for many years, and also volunteered at Water Street Ministries teaching Bible Studies and leading music. Mary Ella was among the first group of persons to move into Woodcrest Villa and was involved in many activities until her illness. Surviving is a sister-in-law, Lois A. Herr of Lancaster; three nieces, Delores wife of Glen Short of Lithia Springs, GA, Dawn wife of David Weaver of Lancaster, and Cathy wife of Glenn Garman of Manheim; great nieces and nephews, Kay Gibbs, Neil Weaver, Jodi Markley, Eric Weaver, Duane Garman and Melissa Heist, and 12 great great nieces and nephews. She was preceded in death by a sister, Arlene Herr and by a brother Franklin R. Herr. A Funeral Service will be held onMonday, October 31, 2011at10:00 A.M.at the Willow StreetMennonite Church,399 E. Penn Grant Road, Willow Street,PAwith the Rev. Robert A. Breneman and the Rev. David Weaver officiating. Friends may call at the chapel at the Mennonite Home, 1520 Harrisburg Pike on Sunday evening from 6:00 t o8:00 P.M.and at the church on Monday from 9:00 A.M.until the time of the service. The family would like to thank the caregivers at the Mennonite Home and Hospice-Mount Joy for the excellent care shown to Aunt Mary during her brief illness. 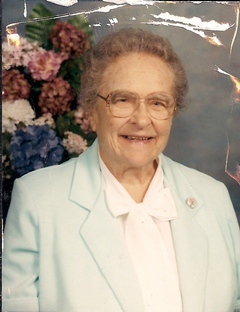 In lieu of flowers, contributions in her memory may be made to the Mennonite Home Benevolent Fund, 1520 Harrisburg Pike, Lancaster, PA 17601 or to Hospice of Lancaster County, P.O. Box 4125, Lancaster, PA 17604-4125. I first met Mary Ella at village vista where I was an LPN and took care of her mother Ella. Then I worked at the Mennnonit Home for 10 years and renewed my friendship with Mary Ella. She was a great lady and we loved her too. I reqret that I could not be at the viewing or funeral for I am recovering from surgery and not allowed to dry until I see the doctor again on Nov. 8th You have my condolences but we know she is in Heaven.